American clothing brand Original Penguin has launched Original Blend, a new fragrance for men. 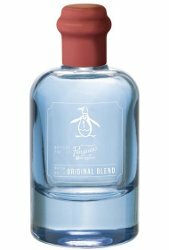 Original Penguin's new fragrance, ORIGINAL BLEND, is a refreshing, clean, marine scent that aligns with the Penguin guy's laid back yet socially active, fashion forward lifestyle. Opening with a burst of Italian bergamot, kaffir lime, and crisp apple, the scent infuses into a blend of crushed lavender, shaved nutmeg, and brushed suede and is then finely wrapped with a dry down of sandalwood, musk, and warm amber. Original Penguin may have made its mark in the 1950s, but it continues to live on today. This fresh, aquatic fougere is the perfect blend of heritage, wit, and masculinity. Original Penguin Original Blend is available now at Lord & Taylor or Nordstrom, in 100 ml Eau de Toilette, $65.